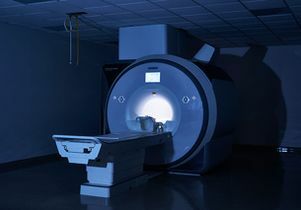 A woman with major depression lies as motionless as she can, her head inside the doughnut hole of an MRI scanner that clangs, beeps, chirps and buzzes as it captures images of neural activity. She’s wearing headphones so she can listen to Pandora. However, brain mappers can see on their computer screens what’s going on in her head. At the UCLA Ahmanson-Lovelace Brain Mapping Center (ALBMC), they are measuring her brain’s structure, shape, chemistry and function before treating her with electroconvulsive therapy. A few days after the treatment, they’ll map her again to compare the before and after. Two hundred miles per hour is the top speed of signals that pass between active neurons, the cells that process and transmit information through electrical and chemical signals. Billions of them are at work in our heads. At UCLA’s brain mapping center, scientists map the paths those neurons take and the networks they form with high-tech scanners, enabling the study of a vast array of processes going on in our brains. These include sleep, learning, aging and memory, and the aberrant activities caused by such afflictions as schizophrenia, Alzheimer’s and Parkinson’s diseases, autism, clinical depression and brain injuries. Brain mapping was named one of this decade’s “10 Big Ideas of Brain Science” by Scientific American Mind, and UCLA has been in the forefront since the beginning. In 1993, Dr. John Mazziotta, now vice chancellor of UCLA Health Sciences and chief executive officer of UCLA Health, proposed what became the brain mapping center. Today, the center is a global resource for studying the human brain through state-of-the-art equipment, experienced technicians and a talented faculty with expertise that ranges from the clinic to the physics of instrumentation to computer science and algorithm development. 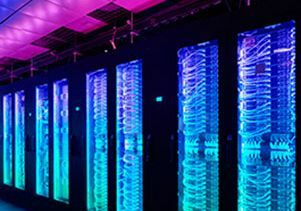 Spencer Lowell, UCLA - Servers in the Neuroscience Research Building represent the digital technologies that enable unprecedented storage and analysis of data about the brain. Brain mapping can be likened to tracking a skyful of jets in flight from one airline hub to another. The more detailed the map, the more visible are the patterns that develop in the flight paths, particularly when the patterns change during peaks of activity. The overall patterns of activity are what brain mappers try to understand because they indicate the effects of electrical stimulation, drugs, disease and diet, among other factors, on neural activity. Mehta has also pioneered the use of virtual reality in mapping, which led to a surprising discovery. “We’ve found that 60 percent of the hippocampus neurons shut down when we map the brain of a subject navigating in a virtual reality world, and learning-related brain rhythms are altered. This has profound implications,” he says. Another team of scientists from the brain mapping center and UCLA’s Division of Digestive Diseases collaborated to discover that bacteria ingested in food have an impact on brain function. They found that dietary changes can alter the signals from the intestines to the brain. This knowledge is expected to help scientists develop new prevention and treatment strategies for digestive, mental and neurological disorders. Another technology being researched is transcranial magnetic stimulation (TMS), the use of magnets to affect neural patterns. Scientists know that it works, but understanding how will likely be of great benefit to people with movement disorders. In 2008, the Food and Drug Administration approved TMS as a treatment for severe depression. Now one team at the center is studying the use of TMS in treating Parkinson’s disease, atypical Parkinsonism syndromes and dystonia. Noninvasive TMS may one day replace deep brain stimulation surgery for Parkinson’s patients. Depression, which is the target of UCLA’s second Grand Challenge, is the research province of Katherine Narr, associate professor of neurology, psychiatry and biobehavioral sciences. One of her quests is to identify the biomarkers of treatment response. Studying changes in the brain — as well as in gene expression, immune response and inflammation — she and her team focus on understanding why and how some people respond to treatment while others don’t. The complete story on the UCLA Ahmanson-Lovelace Brain Mapping Center is posted in the January 2016 edition of UCLA Magazine.